Enjoy new products and vibrant colours throughout with Outwell innovation and design flair to the fore. 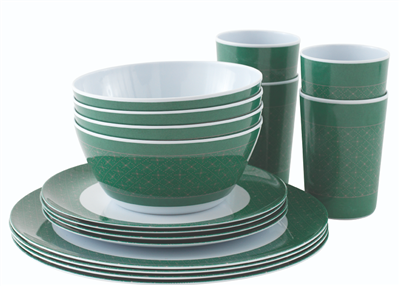 The Outwell Tableware range offers cool colours and lively patterns.The Outwell Tableware range offers cool colours and lively patterns. Durable, easy care and lightweight, all designs are great for campsite dining and outdoor picnics. All are dishwasher safe for that deep clean families insist on after a camping holiday. Blossom 4 persons Picnic Set comprising 4 bowls, 4 dessert plates, 4 dinner plates and 4 tumblers.